aloo chaat is fried crisp potatoes tossed in spicy & sweet chutneys, a few spice powders and then topped with curd or pomegranate arils or sev. aloo chaat recipe with step by step photos. one of the most easiest chaat recipes that one can make is aloo chaat. aloo chaat is basically fried crisp potato cubes tossed in spicy & sweet chutneys, a few spice powders and then topped with curd or pomegranate arils or sev. 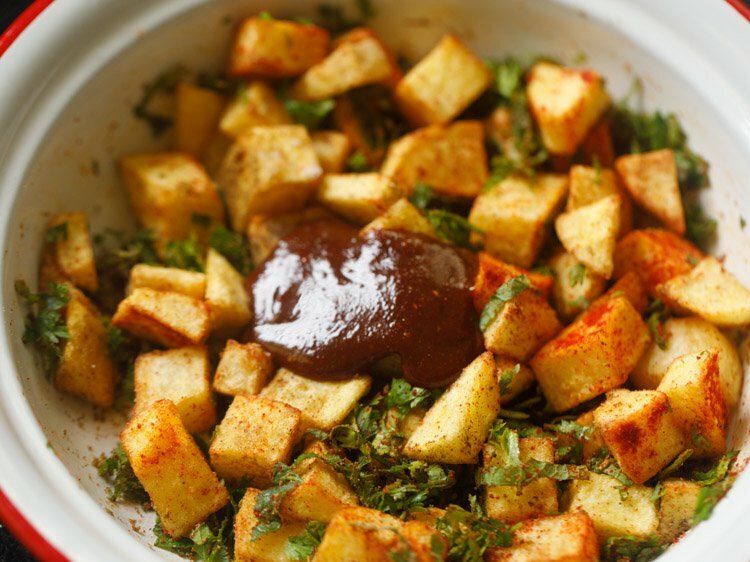 in fact you can make aloo chaat the way you like it. while the delhi style aloo chaat is very popular, in this post i am sharing an easy method of making aloo chaat. this is my easy version of aloo chaat recipe that gives you a tangy, sweet, chatpata chaat. the recipe can also halved, doubled or tripled. 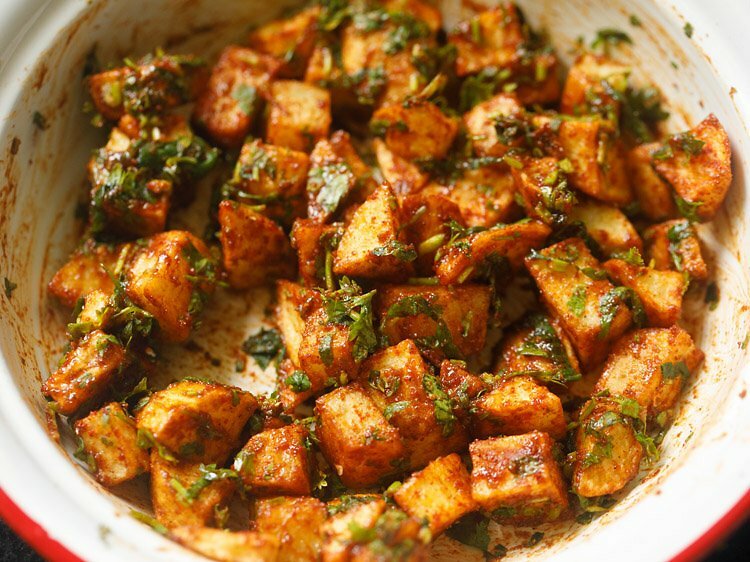 this aloo chaat recipe spares you the effort of making green chutney. i have added sweet tamarind chutney in the chaat. i usually have tamarind chutney in fridge, so i add them to chaats. however tamarind chutney can be skipped. the aloo chaat which is served in street food joints, usually the potato cubes are fried on a huge tawa (griddle). i do have a large tawa, but for ease of frying & handling, i have used a kadai. you can even fry the potatoes on a tawa if you prefer. 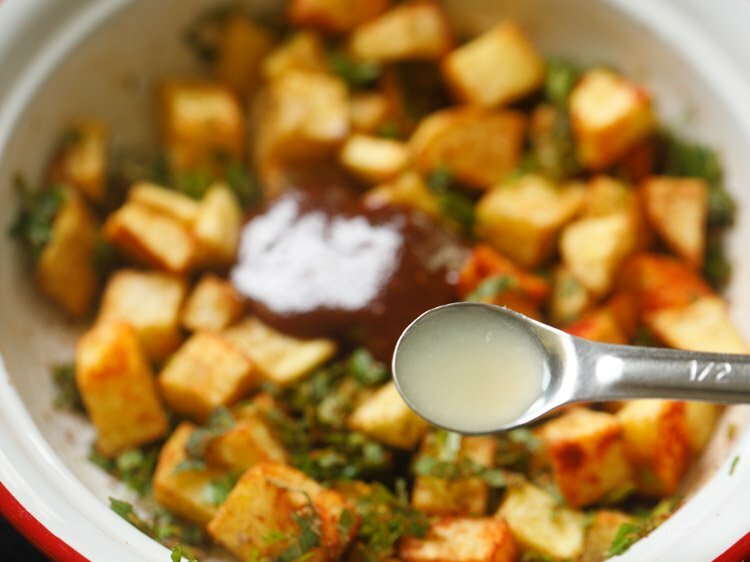 in this aloo chaat recipe, curd can also be added. if you like then you can sprinkle some sev while serving. you can add spice powders as per your taste. for the recipe post, i have shallow fried the potatoes. you can even air-fry them if you have an air fryer. on occasions, i also air fry potatoes when making chaat or for making french fries or for any dish where fried potatoes are needed. i have shared the frying method here as everyone does not have an air fryer. 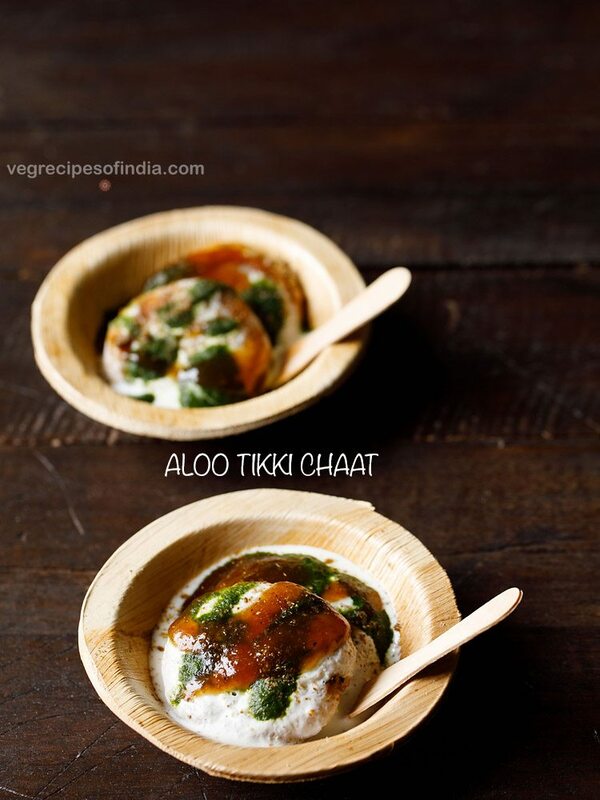 this aloo chaat recipe can be doubled. 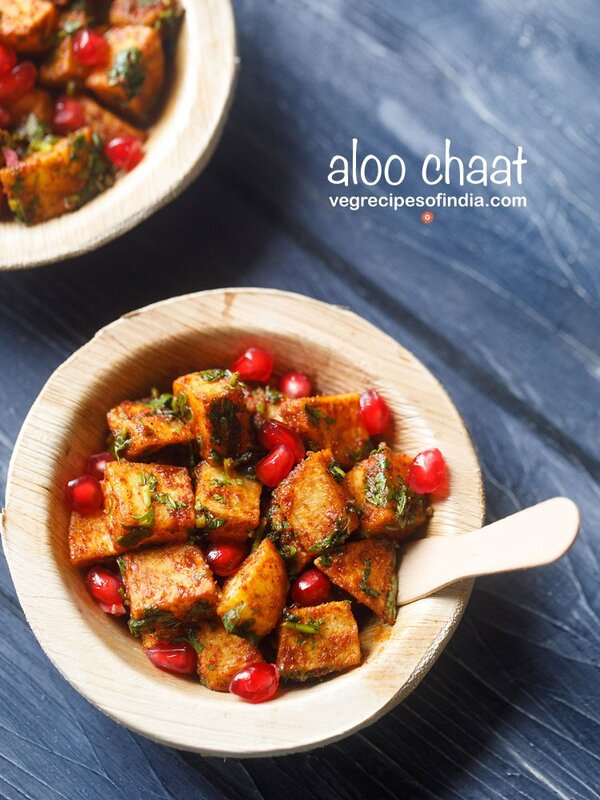 aloo chaat can be served as an evening snack or as a starter snack before meals. 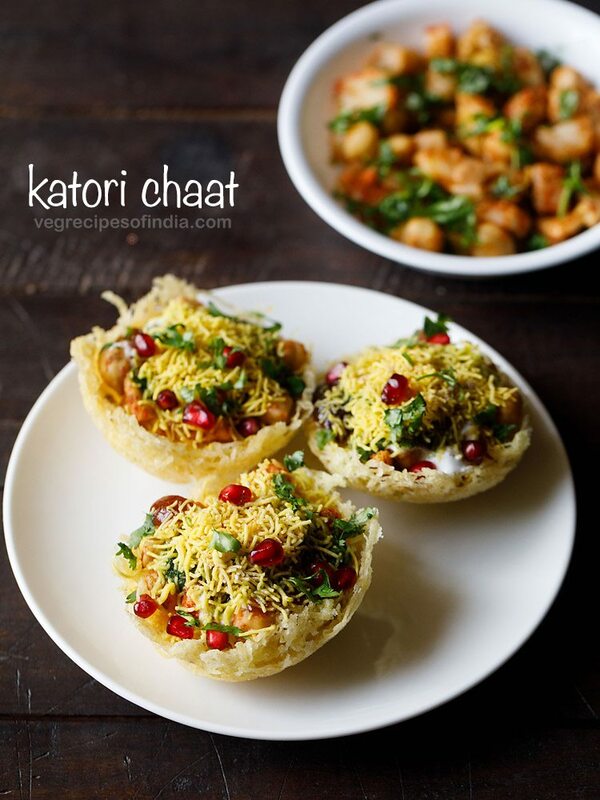 few more chaat snacks recipes for you ! 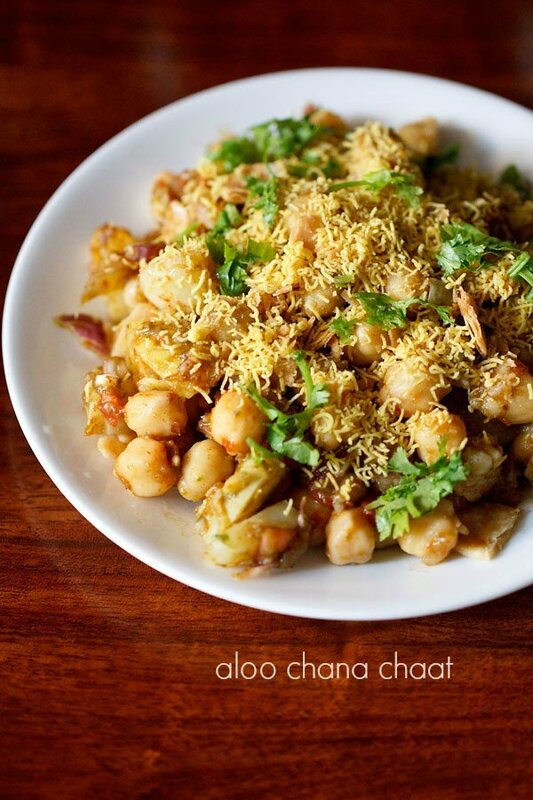 katori chaat – popular chaat snack where fried potato baskets are topped with cooked chana, boiled potatoes, chutneys and curd. 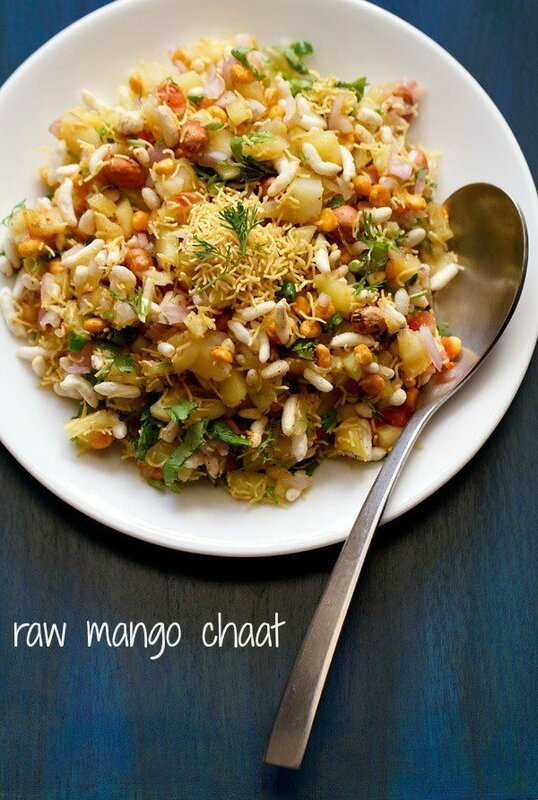 fruit chaat – this is a delhi style spicy, tangy and tasty fruit chaat recipe. papri chaat – popular north indian street food made with papdis, boiled chickpeas, potatoes, pakoris and curd. 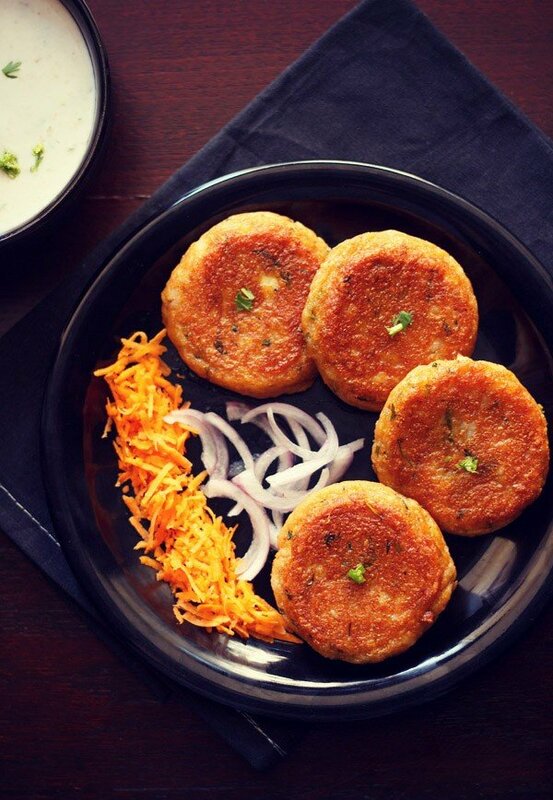 aloo tikki – popular north indian street food snack of spiced, crisp and tasty potato patties. rinse potatoes and then peel them. chop the potatoes in small bite sized cubes. heat 4 tablespoons oil in a frying pan or kadai. keep the flame to medium. add the potato cubes. 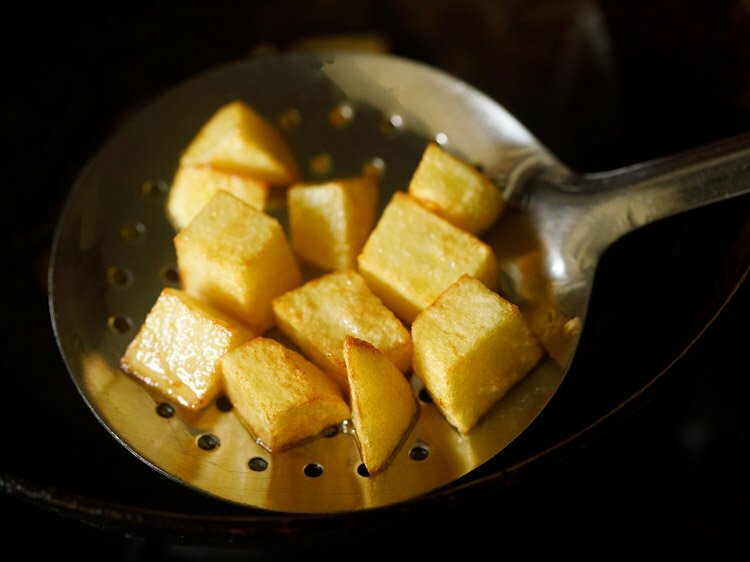 you can fry potatoes in one or two batches depending on the size of the pan or kadai. when one side become light golden, turn over and fry the second side. keep on turning the potatoes as required for even frying. fry till the potatoes turn crisp and golden. 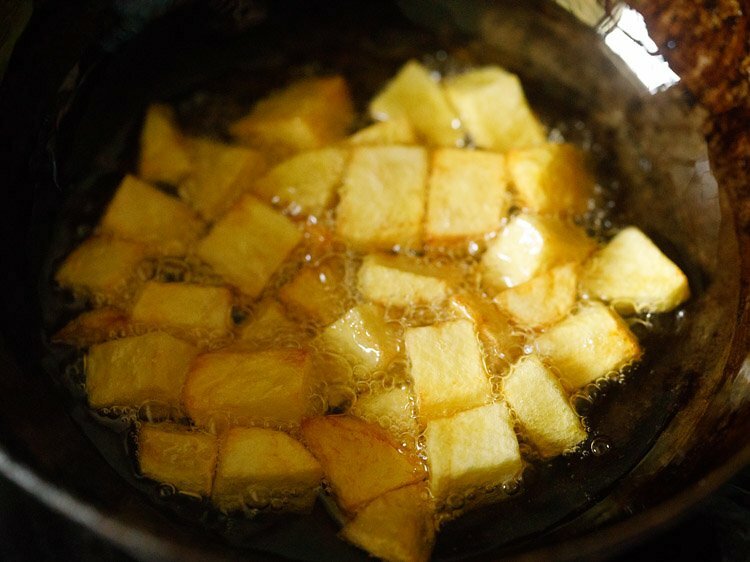 make sure to fry well so that the potato cubes are not raw or half cooked from the center. remove with a slotted spoon. place the fried potatoes on kitchen paper towels. when the potatoes are still hot, take them in a mixing bowl. add all the spice powders mentioned above. you can adjust spice powders as per your requirements. also add black salt or white salt as per taste. 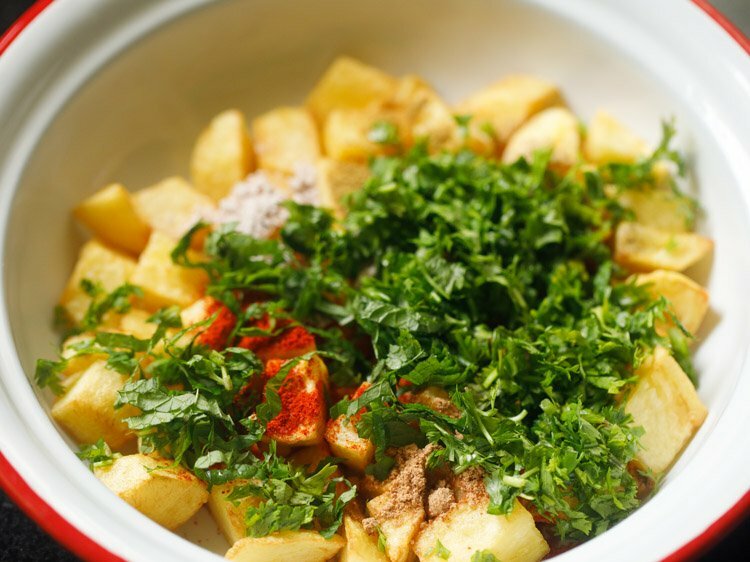 add 1 tablespoon finely chopped mint leaves and 2 tablespoons finely chopped coriander leaves. at this step you can also add 1 green chili (finely chopped) – optional. green chilies give pungent and hot notes while eating. add only if you can eat raw green chilies. then add 1 tablespoon sweet tamarind chutney and 1 to 2 teaspoons lemon juice or add as per taste. 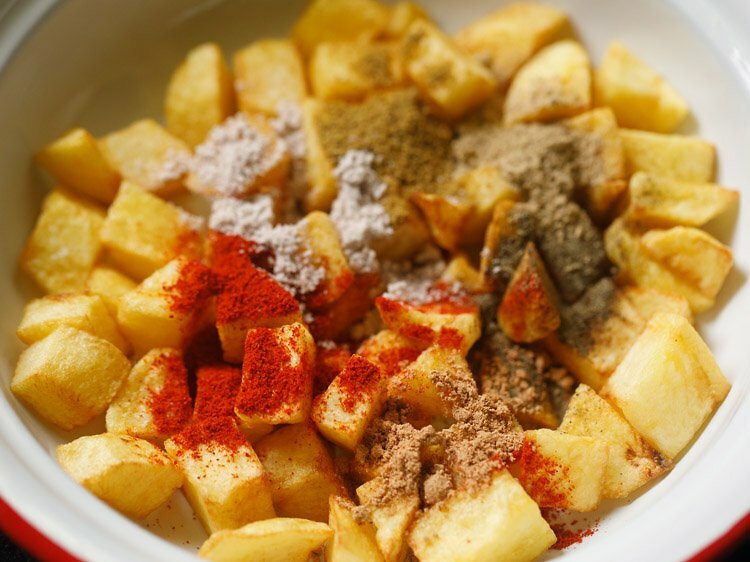 toss and mix everything very well, so that the chutney, spice powders and lemon juice is evenly coated on the fried potatoes. place the aloo chaat in a serving bowl. while serving aloo chaat you can garnish with some pomegranate arils. you can also garnish with sev if you want. 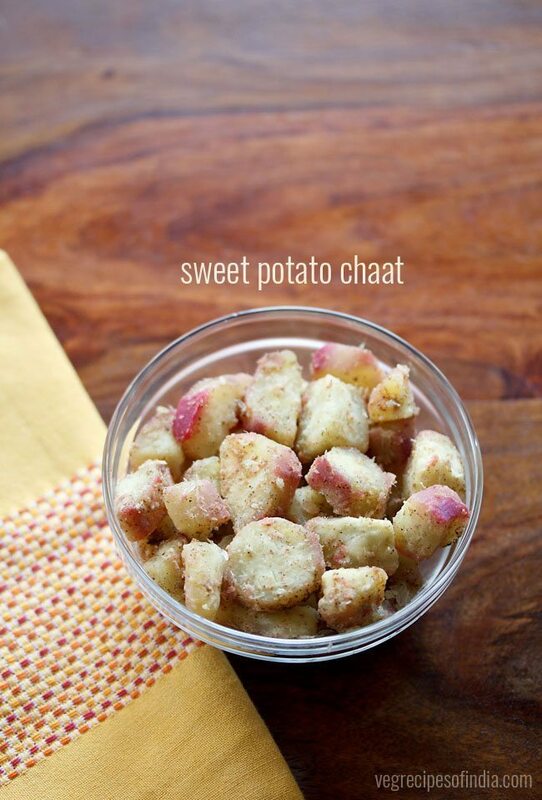 serve aloo chaat as an evening snack or a starter snack. you can even air fry the potatoes instead of frying them. 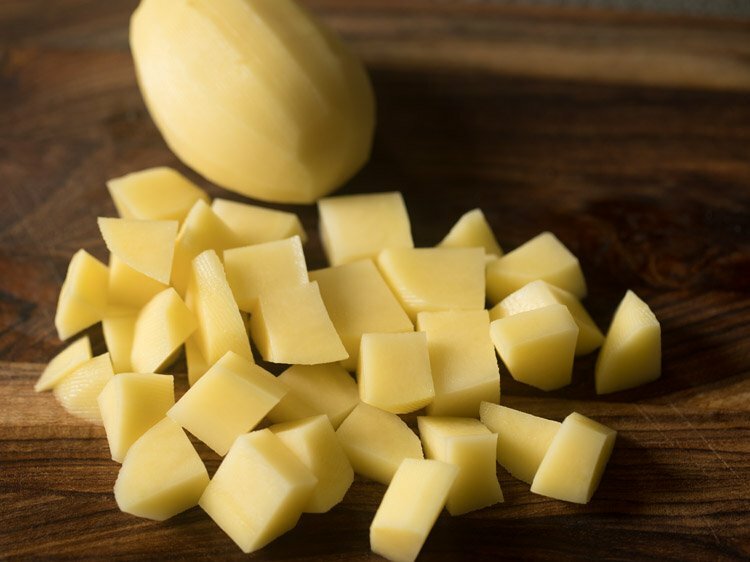 1. rinse 3 medium sized potatoes (250 grams) and then peel them. 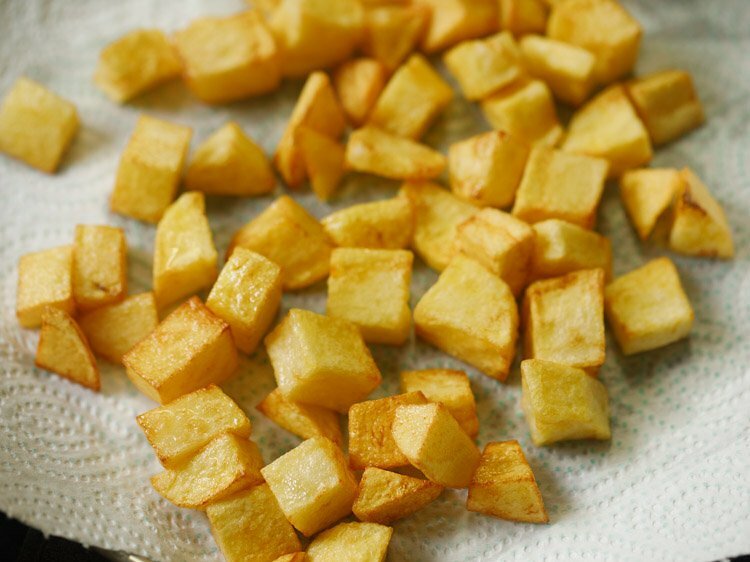 chop the potatoes in small bite sized cubes. 2. heat 4 tablespoons oil in a frying pan or kadai. keep the flame to medium. add the potato cubes. 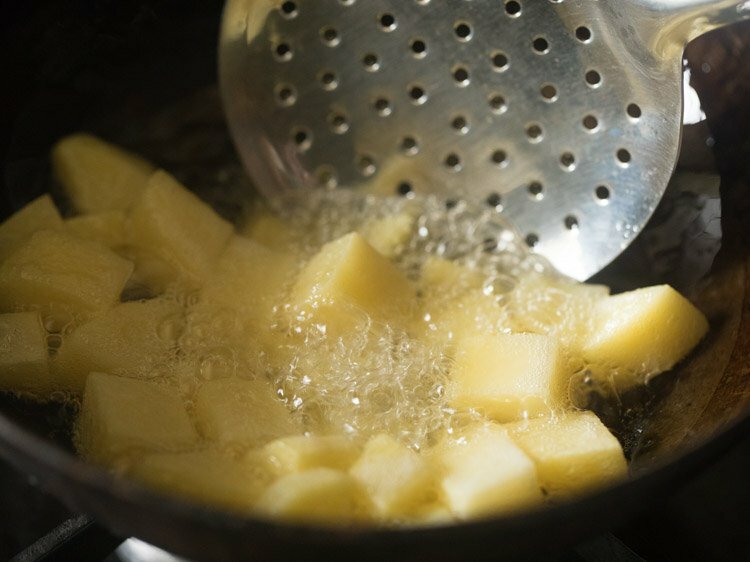 you can fry potatoes in one or two batches depending on the size of the pan or kadai. 3. begin to fry them. 4. when one side becomes light golden, turn over and fry the second side. keep on turning the potatoes as required for even frying. 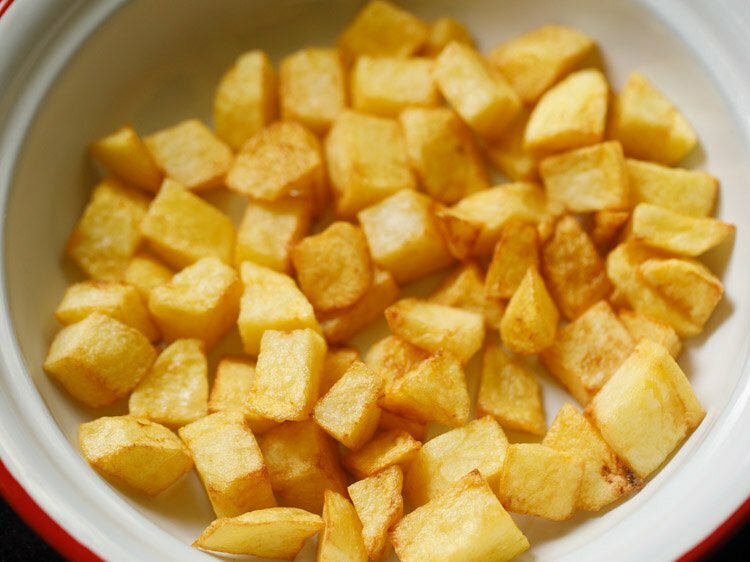 5. fry till the potatoes turn crisp and golden. 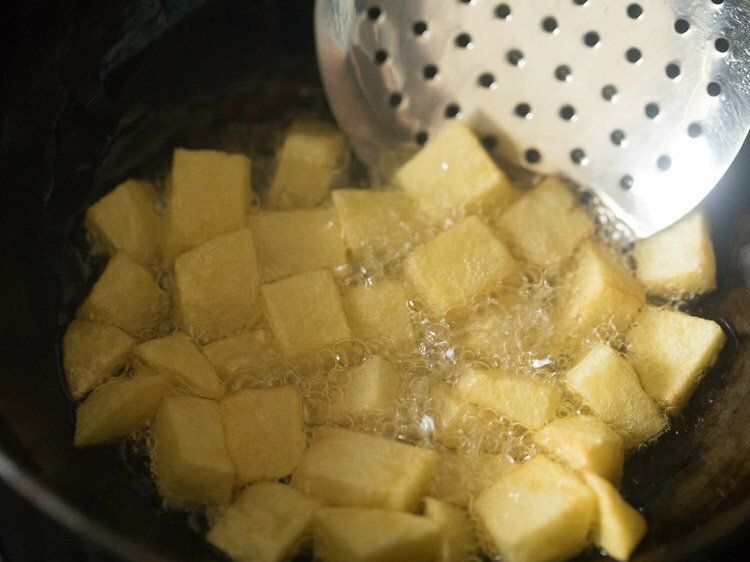 make sure to fry well so that the potato cubes are not raw or half cooked from the center. 6. remove with a slotted spoon. 7. place the fried potatoes on kitchen paper towels. 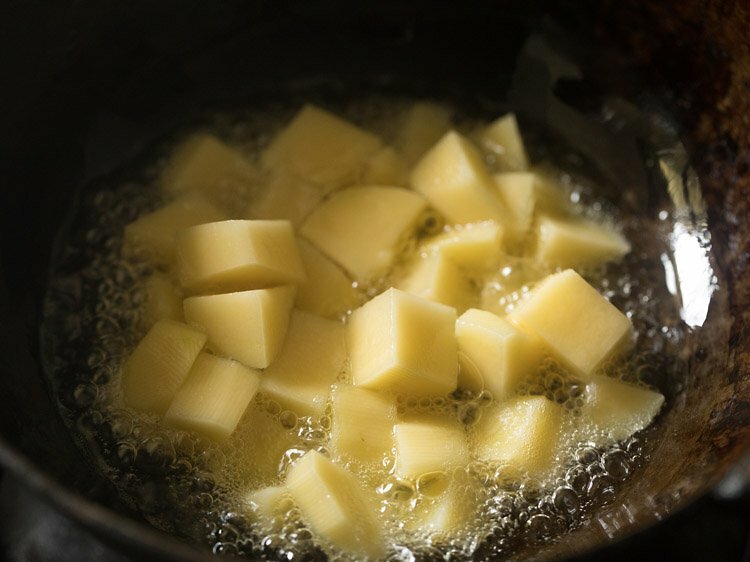 after frying the first batch of potatoes, you can start frying the second batch. 8. when the potatoes are still hot take all of them in a mixing bowl. 9. add ¼ teaspoon black pepper powder, ½ teaspoon kashmiri red chili powder, ½ teaspoon roasted cumin powder, ½ teaspoon dry mango powder (amchur powder) and ½ teaspoon chaat masala powder. also add black salt or white salt as per taste. you can adjust spice powders as per your requirements. 10. next add 1 tablespoon finely chopped mint leaves and 2 tablespoons finely chopped coriander leaves. at this step you can also add 1 green chili (finely chopped) – optional. green chilies give pungent and hot notes while eating. add only if you can eat raw green chilies. sometimes i do add them in the aloo chaat i make for myself. 11. toss and mix well. 12. then add 1 tablespoon sweet tamarind chutney or add as per taste. 13. sprinkle 1 to 2 teaspoons lemon juice or add as per taste. 14. toss and mix everything very well, so that the chutney, spice powders and lemon juice is evenly coated on the fried potatoes. check the taste and if required you can add more of the spice powders, tamarind chutney, lemon juice or salt if required. 15. place the aloo chaat in a serving bowl. 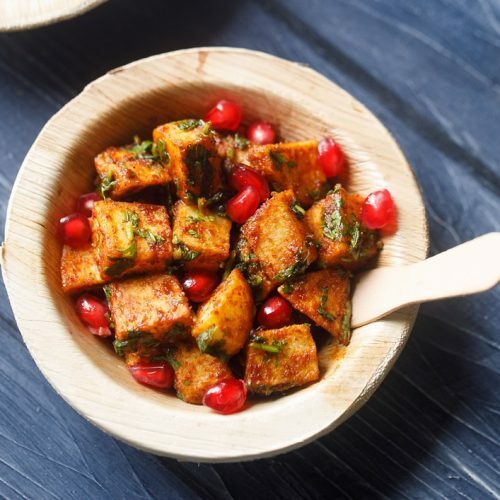 while serving aloo chaat you can garnish with some pomegranate arils. you can also garnish with sev if you want. 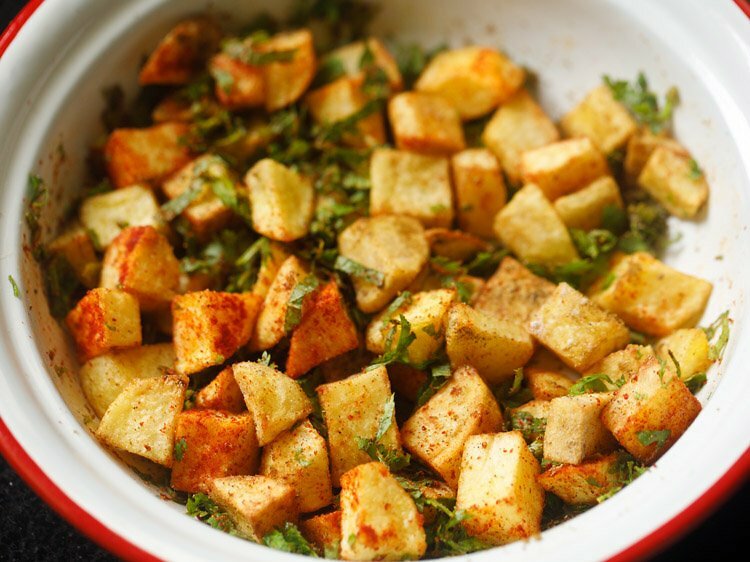 serve aloo chaat as an evening snack or a starter snack.